Last month the Washington Post reported that Botox supplied from "somewhere in Chechnya" is being used as a biological weapon by Islamic terrorists worldwide. At around the same time the Russian nationalist politician Vladimir Zhirinovsky accused "outside forces" (meaning the United States and its allies) of being responsible for instablity, violence, terrorism, smuggling and money forgery in the North Caucasus region. - Damn it! - Agent Smith exclaimed as he stepped on some rusty barbed wire that was invisible in the thick grass and had scratched the lacquer of his shoes. They were already somewhat dusty from the walk. For three hours now he had been wandering around the factory district of the Chechen capital, but was still as far from his goal as he had been two weeks ago – at the beginning of the search. Smith had been sent to Chechnya on a secret mission – to find the underground factories that were producing the anti-aging drug Botox. As everyone knew, a key ingredient in this "cure" for wrinkles was the deadly poison, raw botulinum toxin, which terrorists led by Bin Laden might easily use to wipe out the whole of mankind. 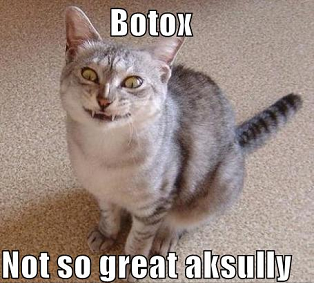 Or at any rate the part of it that regularly rubs Botox into their faces. According to Smith’s information, one the districts of Grozny was called "Factory". He had decided that the underground factories could not be located in a place with such a name, because it would contradict all the principles of conspiracy. So he would have to search search the rest of Chechnya. Smith had foreseen few problems with this search. Post-war Chechnya had almost no industrial production, and therefore any factory would be easy to spot. But his two-week search had been to no avail, and in despair he had resolved on a completely illogical step – to explore the Factory District. The first thing Smith saw was a huge glass building in modern style with a large signboard that said "Botox Factory". In total shock, his head swam, and he had to sit down on the kerb. - Are you all right? Do you need help? - Through a mist Smith saw a bearded face peering down at him with sympathy. - Who are you? - was all the American could manage to get out. - My name is Said. I work at the factory. I’m a foreman - the man replied, extending his hand in greeting. - This factory? - Smith, asked, pointing. - Do you make Botox? - Yes, we do, - Said nodded. - And the factory is legal? - Smith went on. - I’ve heard that Botox is made in secret. And that the factories are very hard to find. - Well, we recently moved to new premises. Closer to the others - the foreman said, looking round him with a wide, circular gesture. Smith looked. The Botox factory was surrounded by other similar-looking buildings in hi-tech style. - After we were refused an oil refinery here in Chechnya they allowed us to open a special industrial zone. Like the one that there was in Ingushetia. Except that we have to focus exclusively on the “beauty business”. Our president says that we’ve suffered too long from the horrors of war, and now in order to compensate we must become the most beautiful republic in Russia. As if to confirm what Said was saying, two girls walked by, slender and smooth-skinned. - Excuse me - a voice said, suddenly - Our economy is not only based on the production of beauty cream! The voice belonged to a man of about thirty, who was wearing a handsome crocodile-skin jacket and sat in an idling Jaguar by the side of the road, from where he had been listening to the conversation. - My name is Uvais, and I’m a factory worker, he said. - Our plant is just down the road from here, near Karpinka. - You make crocodile leather? – asked Smith, trying to be shrewd. - No, our plant prints counterfeit dollars - said Uvais. - What? - Smith exclaimed, sitting down on the kerb again. - You bet! - the man said eagerly. – But it’s a long story - he explained - We used to print dollars and euros, and even rubles. But the Antimonopoly Commission caught us. We had to stop production for a while. But we’re planning to expand again. We’re going to print Australian and Canadian dollars and get around the Commission that way,” the worker said, cheerfully rubbing his hands. - And how much do they pay you? - Smith inquired. - Oh, they're always behind with our pay, of course - said Uvais. - We have to take the factory's products instead. - That’s too bad - Smith said sympathetically. - Don’t worry - Uvais said, smiling. - The main thing that the Republic isn't being subsidized any more. It can live on its own production - he said with pride. - Ah, you’re a patriotic fellow, I see! - Smith replied in delight. - Of course. I’m glad that we simple factory workers can help our republic by means of honest toil! - Uvais exclaimed. - Well done! - cried Smith, seizing the man’s hand and shaking it excitedly. And a little later, less emotionally he asked: - By the way, could you take me closer to your plant? I'd like to have a look at it. - Of course, hop in - said Uvais. Smith got into the Jaguar. The car rolled slowly down the brand new highway, and before the agent’s eyes floated enormous new plants and factories, giant chimneys that belched smoke and trains that sped along a narrow gauge railway, transporting factory goods to the freight yard at the railway station. Smith pressed his face against the window glass and eagerly took in the scene. Smith sat up in his seat and tightened his belt. He felt calmer now. In a few minutes' time an airplane would take off from the runway at Grozny airport and carry the Amercian agent back to his homeland, where he would have something to tell back at headquarters. - Well, that was quite a circus you put on! - "Said" said, slapping his Chechen colleague on the shoulder. – What an actor you are! I could scarcely keep from laughing out loud!